Classy. 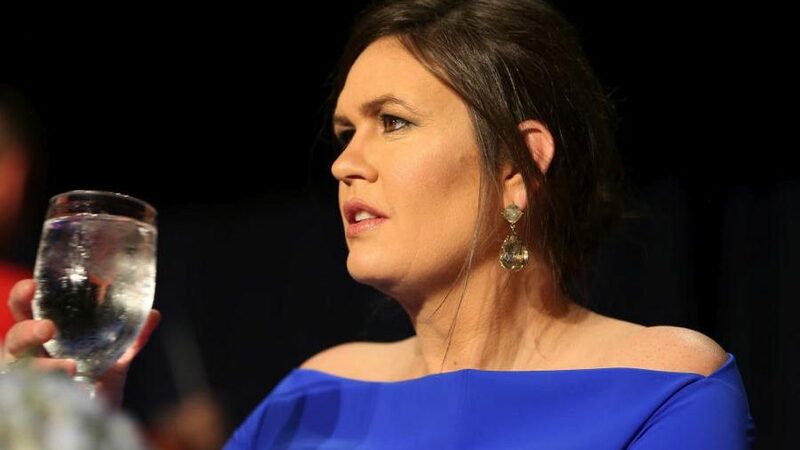 Sarah Huckabee Sanders attends the 2018 White House Correspondents' Dinner at Washington Hilton on April 28, 2018 in Washington, DC. She would be viciously attacked by the night's entertainer Michelle Wolf. Instead, Trump held a rally in Washington Township, Michigan. In light of events, it’s clear he made the right choice. However, those booking the entertainment did not. The White House Correspondents’ Dinner is a fancy annual affair where those who cover the White House gather in their finest and celebrate their own wonderfulness. That’s fine. Presidents would come and good hearted punchlines would fly in both directions. Then Hollywood glitz started creeping in. The correspondents fought over who could bring the hottest celebrity. Future First Lady Kim Kardashian West, for example. However, in recent years, the dinners served up two dishes pumped full of spiritual botulism: Malice and Vulgarity. Think of Stephen Colbert, who in 2006, went on a nasty tirade against President George W. Bush. Barbara Bush’s funeral had more genuine laughs. Think of Larry Wilburn, whose “n-bomb” dropping hostility last year was matched only by his routine’s complete lack of actual humor. Think even of President Obama, whose snarky swipes at Donald Trump in 2011 lit a fire in the businessman that is now burning down every trace of Obama’s legacy. With Sanders seated just a few feet away, Wolf opened her attack with “I love you as Aunt Lydia in The Handmaid’s Tale.” Aunt Lydia is the show’s evil disciplinarian. That, as Yahoo News says, was “one of the kinder barbs.” “I’m just excited Sarah finally gets to go to the prom,” she cracked. “She burns facts and uses the ash to create a perfect smokey eye,” she hissed. Wolf would go on to compare Sanders to a white woman’s version of an Uncle Tom. She repeatedly called her a liar. She attacked Sanders’ appearance. If a comedian attacked a liberal woman that way they’d never work again. Instead, the left being the left, Wolf is getting her own show on Comedy Central. And who did she attack? The woman who busts her tail every day serving and communicating with the people in that room. Shame on the correspondents for not booing. Let’s all watch Monday’s briefing. Will the White House correspondents be able to look Sanders in the eyes knowing they paid for that pillaging? “Decency and purpose.” As if Wolf or her like-minded peers have use for either. As for Sanders, she met the insults with stone-faced silence. It’s called “class.” It’s called “dignity.” It’s called knowing who she is in Christ … and knowing that long after Wolf is a lost footnote on Wikipedia, Sanders will be hailed as an inspiration to a generation of young women. The association’s president Margaret Talev fed a line to CNN’s Reliable Sources Sunday. “My only regret is that to some extent those 15 minutes are now defining four hours of what was a really wonderful unifying night and I don’t want the cause of unity to be undercut.” The cause of unity. Sure, Margaret. You hire a Trump-hating liberal from The Daily Show for unity? That’s like plucking a member of the Klan to help promote racial harmony. Perhaps they’ll even take Trump’s suggestion of Fox News’ impish Greg Gutfield. Gutfield dishes political humor but with a twinkle. You see the same thing with Sander’s father, Mike Huckabee. Of course he’s partisan. But his quips come with an undertone of grace. They don’t gurgle out of a repository of hate. It’s tragic how hatred has become the norm in political comedy. As I’ve written before, cruelty is easy in comedy. Partisan nastiness is as easy as sneezing at a pepper factory. If I was of a mind I could fill the morning with tweets about Wolf matching each of her Sarah insults with three right back at her. Humor should not be used to rip up. It should be used to smooth over and mend together. Al Perrotta is the Managing Editor of The Stream and co-author with John Zmirak of the soon-to-be released Politically Incorrect Guide to Immigration. It’ll be out May 21 from Regnery, but is available now on Amazon and Barnes & Noble. Out of the mouth the heart speaks. This just shows how vile they are. I am looking for those on the left wanting to unhook from that. Even CNN called the matter in question on one round table. It’s remarkable how effective Hillary’s campaign has been, not in winning of course, but in setting off her lemmings into a multi year descent into psychosis. And while it is nice to see some on the left separate themselves from this psychosis, the Dems will unfortunately try to use the same tactics as Hillary because they have nothing else. Brace yourselves, more madness is on the way for the midterms, albeit in smaller form like aftershocks from an earthquake. These people are mindless freaks. I’m still waiting for the love and tolerance the left so says they have tons of it. If they go low, we go high ? I guess they switch places. They have surpassed over kill on all of this. It’s just a matter of it being repeated enough until every sector becomes aware of it. How refreshing will be the reverse if Republicans will hold steady, but step forth responsibly. It is good to see in full display the true character of these folks. I guess Karma a bi€£¥. She deserves all she got. Really? Think you’ve got it all wrong sweetheart. You are the nasty horrible person, not Sarah. Really. What has Sarah ever done that is horrible or deserved any of that nastiness? But, you may not understand anything but nastiness if you think this way. Sad for you. Just look around 3 pm week days when she gets on the White House pressroom podium and starts lying, while complaining that the whining billionaires isn’t treated fairly. Thus speaks a duped kool-aid drinker. Pity you. Even the usuals are backing off that hideous diatribe. What have you become? Wolf said that Huckabee is a liar and that she’s not good at doing makeup. She advised at the beginning that she was going to tell jokes (no one is forced to find them funny). She never said Huckabee is ugly or fat. Words that Trump use to describe many women. Trump only refer to 1 woman 🙂 Rosie O’Donnell and you lie saying “many women”. Have you said anything nasty to someone ? I guess you did already because you endorse others heaping nasty remarks at Sarah. Why do you support others from attacking Sarah ? Sarah reports the right information to the press, how does that equate to lies ? She does not make up stories by herself to reply the press. You sow hate and you shall reap hate. funny it is exactly what she is sowing. So I guess your right. The eternal law of karma. You sure do brighten up a room, Sunshine! Hmmmm — musing on how the Lord can make even that voice more pleasing. She’s all sharp edges everywhere, that crusted jelled hair, reflecting a jagged edge on the inside. Jesus can beautify her with his salvation. It was hilarious. If anyone deserves it, it’s Sarah Huckabee. You are deceived if you think she lies answering that volley of your fellow deceived ones. It is the overblown resistance of sour grapes election losers who purport lies because they cannot face the truth. Instead of changing, they try to rearrange. They are heading for a collision course if they keep this up because adding injury to insult boomerangs on leftists as well as anyone else. They can’t hide from it in their numbers; it will just be a harder fall. Some are just wicked. Your comment indicates you might place yourself in that category. I hope you change, because truth and good are against you and you cannot overcome them. Chip, you gotta stop being crazy and ramblely. Ah, the leftist mirror. Your image there somehow reflects others. Oh chip, you’re just so stupid and silly. Like a crazy sitcom grandpa. What lovely people you all are and such command of the language. God bless you. Why thank you Chip, that was nice of you to say. May Godzilla’s atomic breath be upon you. Actually, I’m guarded from that. That’s what they all say Chip, that’s what they all say. Then they get atomic breath’d. Mothra couldn’t withstand it, and she’s a god for goodness sake. Greater is He who is within me than he that is in the world. All false gods are devil inspired and tools. Jesus defeated him over 2,000 years ago. He delegated that authority to those receiving his spirit. Those devils are under our feet. And there is no little “g” god for goodness sake. As if an Arab Jew whose name most certainly was not jesus (which is just a bad English translation of a bad Latin translation of a bad Greek translation of a Hebrew name, most likely Yeshua) could ever withstand Mothra’s poisonous yellow scales. To say nothing of her trapping silk, fierce bite, or titanic strength. I mean, she’s lifted both Godzilla and King Ghidorah after all. Plus she’s a giant Japanese moth, I mean, come on. IMHO, Michelle Wolfe has been given more press coverage than she deserves. It should have been swept under the rug & ignored.